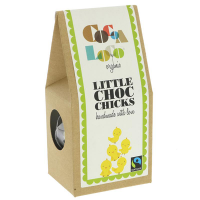 Scrummy ten pence-sized chocolate buttons made with a great cocoa-rich organic milk chocolate. 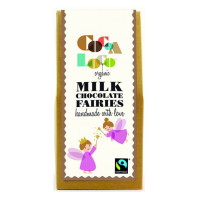 Cocoa Loco is a British company who produce award winning handmade chocolate using the finest single origin beans from the Dominican Republic that are Fairtrade and Organic all the way! Proof that the most delicious chocolate can be 100% ethical too. Milk chocolate containing cocoa solids 37% minimum & MILK solids 21% minimum (sugar, cocoa butter, whole MILK powder, cocoa mass, vanilla powder.